Our little break Down by the Sea is over and yesterday we got back to Spain and are now back Up the Mountain. Today is Sunday, and of course in our rural area pretty much everything is closed. We could have gone out for lunch but we are exhausted. Time to dig around in the freezer and the store cupboard and become an inventive Chica. There’s still the salad basket below which is packed too! Well, there was definitely going to be a tomato salad on the menu. Every day for a long time. The freezer kindly delivered up an Ottolenghi Chicken and Hazelnut dish and all I needed was bread. Did you know that most Mediterranean folk I know won’t even consider a meal complete unless there is a basket of bread on the table? In fact, I think if there was nothing on the menu in a restaurant they’d order bread with bread. With not enough time or patience to make a loaf, I thought of tortilla wraps and headed over to check out Tandy’s brilliant recipe at Lavender and Lime. Of course, I had no butter but in the land of olive oil, a substitution was possible, and gave great results. Add the sugar and salt to the flour and mix then pour in the olive oil. Rub the oil into the flour until small lumps form and then rub for a moment or two more to break the little lumps down. Gradually add the water and knead for a few minutes until you have a smooth dough. Rest the dough for 30 minutes (I just left it on the counter) and divide into four equal pieces. Roll out into thin rounds and dry fry in a very hot frying pan, pressing down with a spatula to stop air bubbles forming. Cook on both sides until lightly browned and keep warm by wrapping them in a tea towel. Enjoy your tortillas whilst asking your other half where all your glass jars with lids are for your tomato bottling session, only to find out he has thrown them all in the recycling. *Rest assured that no dogs or even humans ever went hungry in our house! For a delicious gluten free bread/wrap, take a look at my Socca recipe. It´s been a while, I´ve missed you all. Lots of news to update you with though. Just the final touches to the units (handles, skirting boards), then the wall units to follow. There´s still wall tiling to go but … pah…easy peasy compared to some of the things we´ve been doing. Of course, when you have a hob and an oven (as of yesterday) you can COOK!! Oh what joy to have a relatively dust free area to prepare meals that are not sandwiches filled with cement or fried eggs lightly dusted with sawdust. Supper was a simple meal of grilled lamb chops sprinkled with Malvern sea salt and a squeeze of lemon juice, with rice mixed with garlic mushrooms. It was nothing complicated but with a good glass of wine it tasted like the food of the gods. Lunch today was a sharing platter (we have a lot of those as it means less washing up, very important when you´ve had to wash up with cold water in a bucket!). Good old tortilla, a leftover corn cob and some salami from home with a little salad made with sweet juicy local tomatoes. Hopefully soon I´ll be able to get a little more adventurous in the kitchen, and we´re not talking about power tools here. So…a little more news which may leave some of you wondering if we both need to get our heads examined. Things have gone so well, and we have learned so much…we´re going to do it all over again when we´ve finished this house. Yes, you heard right. Just around the corner from this house was another one crying out for some love and attention. It has a very similar scary carpet but we´ve learnt not to fear the shag pile. It´s been more recently modernized…we´re talking some time during the late 1970s as opposed to the early 1960s in the current house, so a little less work. But not much. No…your eyes do not deceive you…that´s a downstairs bathroom coming off the “oh so modern” kitchen. We´re getting the internet installed though, so cross your fingers, toes and eyes for us and hopefully in about a week I´ll be chatting away to you all in my usual fashion and hopefully doing a bit more talking about cooking and a little less about house renovating. But I´m not making any rash promises! So, Sunday 1st July, and it´s been a pretty Perfect Day here Up the Mountain. (I´m just enjoying the song for the music, not looking into the deeper meaning here)! We packed up the car with dogs, chairs and a picnic and headed down to a shady picnic area near a local lake. Of course, there was Jamon y Queso (ham and cheese). No Spanish picnic would be complete without tortilla, and we also had some fried, salted peppers (although they were sweet today, not spicy). And plenty of gazpacho to cool us down. Then after chilling out, we headed off to watch the football….a glass of tinto de verano got us in the mood. And … well…I went for the red shirt in the end. I figured, Spain is home, and home is where the heart is….Sorry Papá 4-0 to Spain against Italy! PS. Off again to the UK for a few days on Tuesday, so I´ll catch up with you all when I get back on Sunday. Big Man hasn´t exactly gone hungry over the last two weeks, but a lot of my time has been taken up with recovering my dining chairs so we´ve eaten a lot of tortilla. 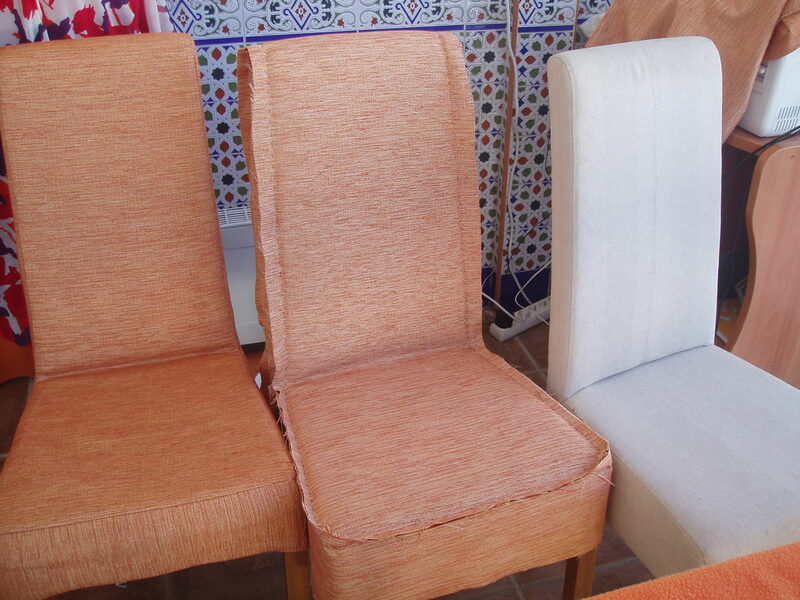 I´ve never been taught properly how to “do” dressmaking or upholstery, but have just picked things up as I went along. I´m sure the finished results are not perfect, and certainly not to a standard that I could get paid for the work, but I was really pleased with the way my most recent project turned out. Big Head me! When we moved into the house 3 years ago, we bought a lovely dining table in a light oak colour and six matching chairs which were upholstered in a cream cotton type fabric. Obviously over time the colour started to look a little sad. Particularly at the top where the chairs are held and moved around. I tried fabric shampoo on them but it didn´t seem to make much difference. At a fabric shop near Malaga, on a sneaky trip to Ikea (to buy napkins and candles, what else?!) 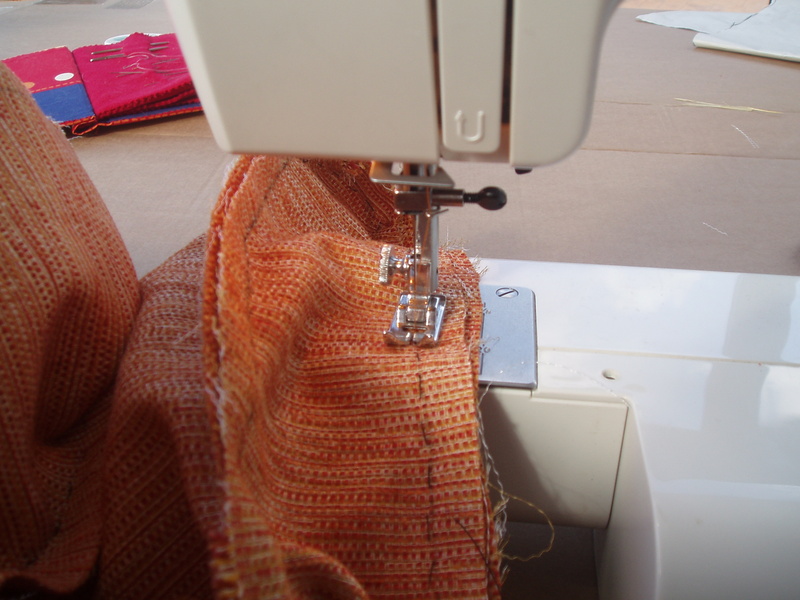 I saw some lovely fabric in a burnt orange colour at a bargain price. I had already measured the chairs and knew I needed just over six metres, so asked for seven (allowing for any mistakes). There was eight and a half metres of fabric left on the roll, so the shop very kindly discounted the last metre and a half and I went home a happy woman. I started out by pinning large sheets of plain paper to a chair. I had had to stick several together to get the pages wide and long enough. Then I drew around the outline of the chair marking corners and edges and then cut the pattern out. The pattern was then pinned to the fabric and cut out, leaving a 2cm edge all around. The hard work then began, as the next part took the longest, particularly on the first chair which I needed to make sure was absolutely right before cutting out any more fabric. Luckily it all worked out well! 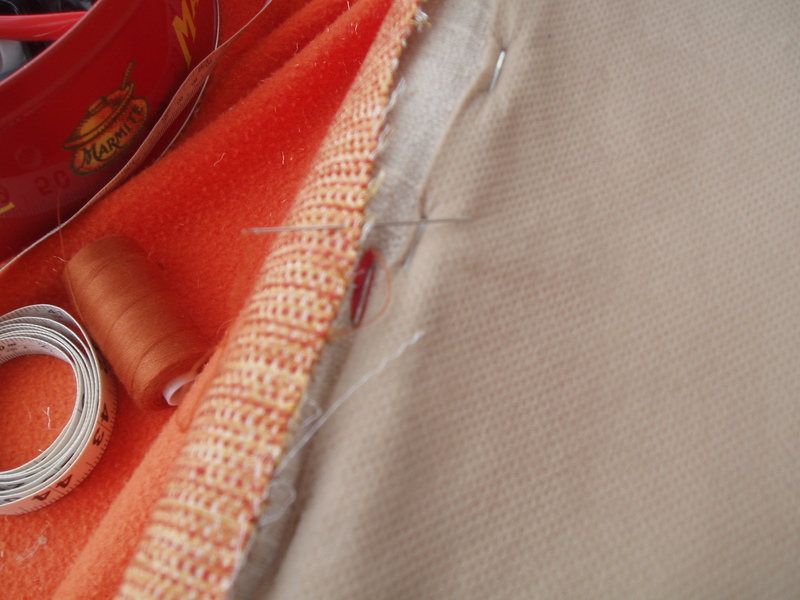 I pinned the fabric, inside out, to the chair, using the pins as though I was tacking the material together. This allowed me to pull it tight and manoeuvre it to get a good fit around the chair. The fabric was then tacked in a contrasting cotton and the pins removed. With the first chair I turned the fabric the right way round and slipped it back onto the chair to see how well it fitted. Phew, all ok, so I was ready to sew. Out came the trusty sewing machine and I machined the tacking in a matching thread with a straight stitch. 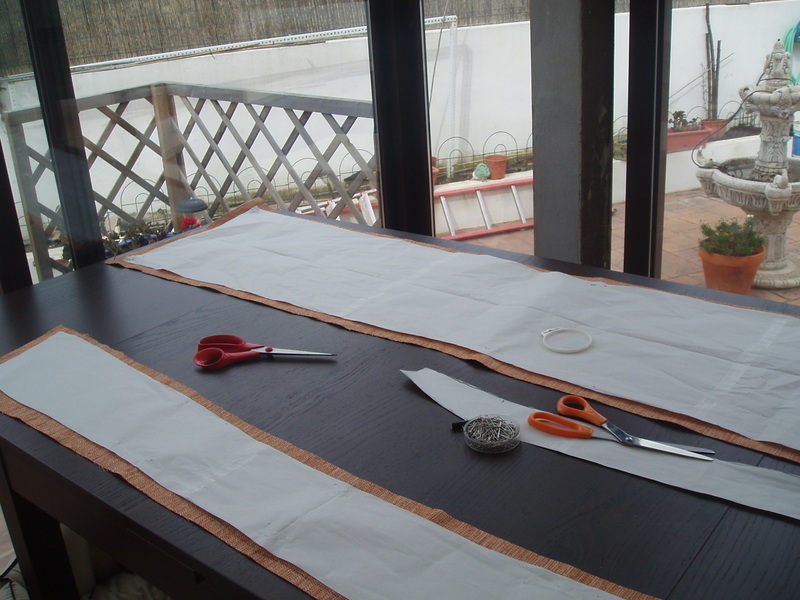 In order to ensure the fabric wouldn´t fray at the edges, I switched the machine to a zig zag and stitched all the edges to tidy them up. 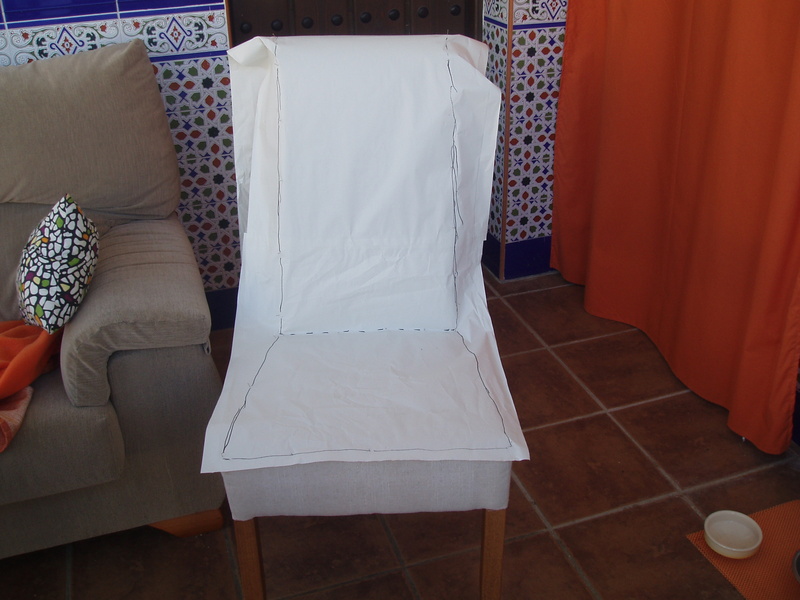 The final part was to turn the fabric right side out, slip it over the chair, and pull it tight at the bottom. 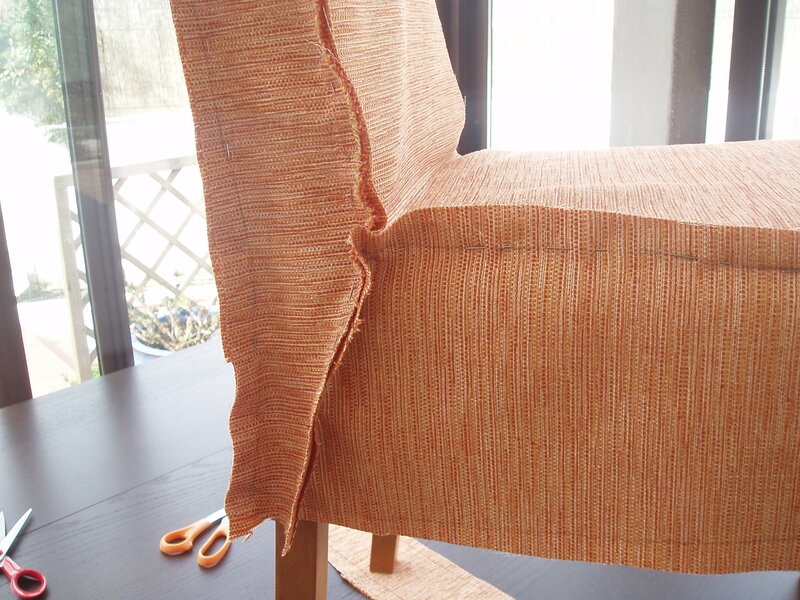 The chair was then flipped upside down and with a fine, flexible sewing needle, I tacked the zig zagged edges onto the underside of the chair. I guess this could have been done more quickly with a strong stapler, but after Big Man put the wrong sized staples into ours the other day (we still can´t get them out), it was hand sewing for me. The first chair took me the longest, probably about 8 hours in total over a couple of days, but by the time I got to the sixth and final chair, I think I was down to about 4 hours! They´re all finished now and I´m happy with the results. Here´s to many delicious meals eaten whilst sitting on the newly covered chairs. A beautiful sunny, Sunday morning. All the more surprising because it´s the penultimate day of January. But just warm enough to brew a pot of coffee while I feed the dogs and get myself a little breakfast sorted out before Big Man and I head off for a walk. It´s been dry for two days with rain before that. Perfect weather for heading up the mountain and looking for wild asparagus. I have to confess I´m not the biggest fan of these beautiful fronds. Although I love strong flavours, they´re just too bitter for me. But Big Man loves a little tortilla made from these for a light supper and I enjoy a simple poached egg on toast – so everyone is happy and minimal cooking for those evenings when you just don´t fancy spending time at the stove. I do enjoy my breakfast. 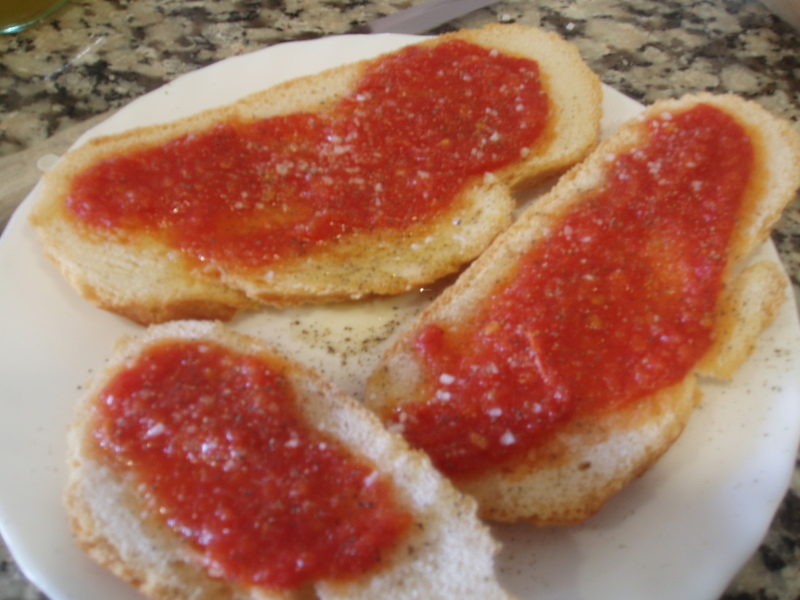 I don´t go all faint and feeble if I miss out on it, but my favourite quick and easy breakfast here in Spain is fresh bread, drizzled with olive oil (from our olives if I´m lucky) with crushed fresh tomato and seasoned with sea salt and a good grind of pepper. All you need to do with the tomato is blitz a ripe tomato with the hand blender – remove the skin or not, your choice and that´s it. It´s usually tastier in summer when the tomatoes have more flavour, but if I come across a gorgeous specimen outside of the warmer months, it´s earmarked for my breakfast. If the bread is a little stale, it´s toasted lightly on my griddle pan. If I fancy some spice, it´s sprinkled with little fresh or dried chili at the end (not so Spanish), and if I´m extra hungry a few slices of jamon are added. But the truth is, the simpler the better. That´s not to say I don´t enjoy a Full English, or a Bacon Buttie when the mood strikes. Come to think of it, a bowl of porridge in winter always goes down well too.